There is a new strategy that baffles some people’s social media. It isn’t cheating, either—psychology is something which has been around as long as we have been smart enough to acknowledge that it’s there. You use psychology every day, too. You may not realize it, but it’s there, hiding in the shadows of your subconscious, waiting to be revealed through some past experience or relationship. I wanted to write about something that would resonate with every business owner active on social media: the topic of making money through the use of social. While money is rarely talked about socially, it is one of the main psychological factors that drives us, motivates us, and makes us do the best we can for our brand. When we’re successful, we are rewarded, and just like Pavlov’s dog, when someone clicks the Buy Now button, we are motivated through triggers to capitalize on that response even more. There is no straight and easy way to make money online. Most people use a platform to create opportunities for their business in order to make the money, but there is still not a direct way to the money. That’s because there’s another side of the pocketbook—you know, the person you’re targeting. This person needs more than to find your site out of the blue, stumble upon the product they have always been looking for, and then purchase. It doesn’t happen that way anymore. Back in the day, one could create that straight path to the money by manipulating search engines through article marketing and link building. It created an opportunity for the site owner to bypass a critical element in the sales process and use what is called Right Now Marketing, where you could appeal to the wants of a consumer by feeding off of their conscious desire. If you were one of the top results in those searches, you didn’t have to worry about anything but building links to make money. In today’s search world, it doesn’t happen quite that way anymore. There is a more human side needed when marketing your products online these days. Now, there is no direct way to make money online. But all is not lost. 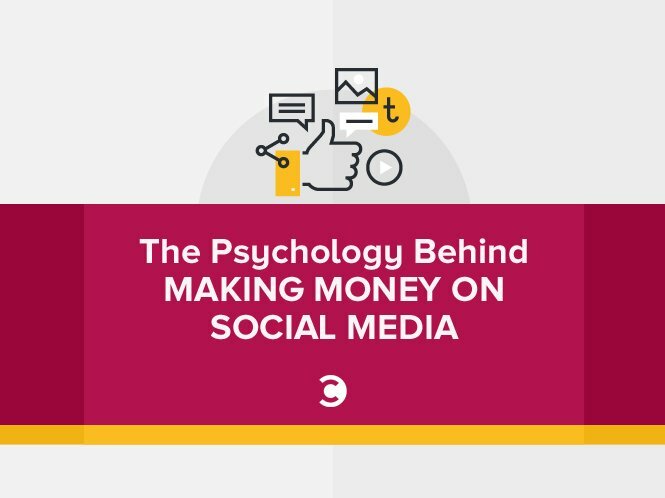 There is an indirect path that makes money every day for most social media personalities, and these are the psychological implications that I want to talk to you about today. Psychology plays an important role in driving traffic from social media. But before this will work, you have to have some things in your corner that communicate what your business is about. Remember the person with the pocketbook that you are trying to target? You still want that person to open their wallet and click the buy button, and it is still possible for them to do that on your site, but there is a more indirect approach to get them to do this. As I was researching this article, I noticed something very important, but I almost missed it at first. A commercial came on television, and before I knew it, I had completely stopped writing and was fully engrossed in what it had to say. It was Flo, the Progressive Insurance woman doing her bit on TV. I quickly scrambled to check the difference between her and her employer on social media. The Progressive Insurance organization page on Facebook has 343 thousand likes. While the “Flo the Progressive Girl” Facebook page has an astounding five million likes! When you can put a face to your brand, more people will be inclined to have a conversation with you, engage with you, and remember who you are after the fact. Scientific research has revealed that the psychological triggers involved with adding a human face to your brand make the experience more memorable for the customer and build trust. The reason for this lies in the emotional side of the psyche. Studies have shown people who are knowledgeable about a certain topic trust others speaking to that same idea because they have already done their homework. When the facts line up with what they already know, and there’s a face accompanying that truth, it becomes a no-brainer. Flo knows insurance. People who need insurance have already done their homework—I know I do when I need it. When you hear language that you have been reading in your research, a bond forms between the buyer and seller. We seek out relevance in this internet world, and the brand who shows their face to the public is already three steps ahead of the rest of us because they play to our emotional psychology. Side note: When you think of Moz, what face comes to mind? See what I mean? Online business growth is more than just building links now. The successful social media entrepreneur actively engages their followers and potential customers on their respective platforms. While you may not make a sale right off the bat, you are looking for results from playing the long game on social. One of the tools to build trust is consistency. When you are consistently engaging, answering questions, and helping people, they will start to get acquainted with seeing you in their stream. This is an idea from the Cognitive Consistency Theory. When people continually see us, talk to us, and get help from us, a certain form of trust is created. When you understand this, you realize people expect a certain kind of consistency from your brand on social media. When people trust you, they will buy from you. Trust takes time to form, and it is through the consistency across several factors that you make it happen. The degree of trust: People may hold you at arm’s length but will still listen to what you have to say. You have the opportunity to create a lasting relationship built on trust here—don’t blow it. Trust diagnostics: This is where the follower or customer engages more actively, and you can see the growth of trust. Attachment orientation: They fully trust you, and while you may not have a personal relationship with this person, they feel attached to you on a personal level and will follow you to the ends of the earth. Stay true to who you are. Always be the same person—that person that they came to know and trust five months ago. If you change who you are, you disrupt that trust and may have to start over. That is why consistency is so important in building trust, why authenticity is important in growing trust, and why trust is such an important part of the relationship process. If trust is at the core of building relationships, let’s talk about bringing the customer into the attachment process. The attachment theory is one that overrides the Dunbar number, which states that a certain individual can only have so many stable relationships at one time. While it would be nice to create fulfilling relationships with each and every person in your target market, it’s just not possible. But hope is not lost! You can still build the relationship on their side of the fence. A guy with 10 million social followers isn’t going to remember the names of each person. I watched someone like this at the Social Media Marketing World conference last year. People would come up to this person and start talking to him like he was a long-lost friend. He was very cordial, friendly, and professional as he greeted each individual. But there is no way he could remember each and every one of those people. However, they knew him. They were attached to him on a different level than he was to them, revealing that trust had been formed on their end, even though it hadn’t been psychologically formed on his end. This person, and you probably know him, is active on social media. He is helpful and knowledgeable. People seek his expertise, and he obliges. He is consistent, and, in my opinion, he is the perfect example of the Attachment Theory in marketing, because while he doesn’t know all of them personally, they know and love him. I’m not here to hurt your head with theory and studies, but I do want you to understand the importance and power that each of these points will have on your ability to make money on social media. I can’t show you a direct path to success. I can’t promise you loads of income if you build links. But I can promise if you stay consistent, stay helpful, and stay who you are, people will be drawn to you and your brand on social. Money will come, but that’s later. Take the time to get to know your target and what they need, and then build a respected and informational platform around that target. Wade Harman is the content marketing director for Kats Botanicals, an online Kratom powder distributor. Wade's content helps entrepreneurs build business success on an emotional level that speaks to your audience.